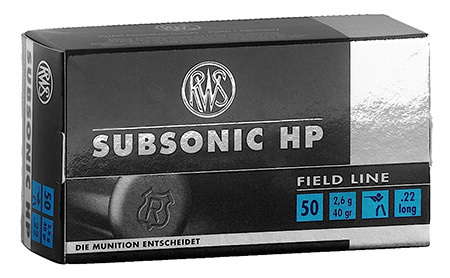 The RWS SUBSONIC HP is a special cartridge for lownoise shooting. The bullet velocity stays distinctly below the sound barrier consequently there is no sonic boom. For this reason this rimfire cartridge is very well suited for weapons with silencers. It offers similar good shooting performance as a standard cartridge but with significantly less noise. Due to the hollow tip this ammunition achieves a sure and reliable effectiveness with small game and varmints. Not suitable for selfloaders.